FIRST THOUGHTS: ...I hope I don't piss anyone off with this one. This book is objectively pretty good, and I can see why other people like it. But honestly? I've heard so much hype for this book for the past two years or so, and now that I've read it, I honestly don't see what the big deal is. (I also felt that way about "Shiver," another book by Stiefvater, so it may just be a case of the author's style not working for me.) It's not bad, it's just... okay. I got through it quickly, and the plot held my interest, but it just isn't my thing. Maybe later installments are better? It's sort of hard to put my thoughts into words, since my overall feeling towards this book is simply, "...Eh." 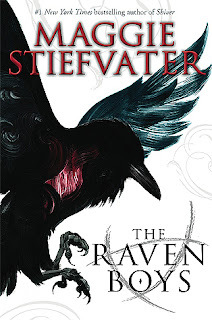 THOUGHTS ON PLOT: The plot is unique, and it moves along quickly, especially once Blue and the titular Raven Boys meet. The plot twist at the end was also well-done; I didn't see it coming, but it made sense, so it didn't feel like it came out of nowhere. I found the whole romance angle to be a bit tiring, though -- not that I was surprised there was a romance. (I mean, it's on the back cover.) It just didn't feel very compelling, at least not to me. While I did skim parts of the book to finish it faster, it did hold my attention very well, and the plot was fine. I think I would've liked it more if the series hadn't been so hyped up before I read it. THOUGHTS ON CHARACTERS: Mixed bag. I liked Blue, for the most part, and the other residents of 300 Fox Way, including Blue's mother. I also liked Adam, but the other characters just didn't grab me. I'm not sure why -- none of them are bad characters. I just had trouble connecting to them, I guess. The chapters focusing on Blue were much more interesting to me; I tended to skim on the ones focusing on the boys. Blue is a likable and compelling protagonist, and it's refreshing to have a paranormal protagonist that's both detached from the paranormal (being a non-seer), and well-versed in it (being the daughter of a seer). It made for a nice balance that a lot of authors don't quite strike. THOUGHTS ON WRITING STYLE: Maggie Stifvater is, objectively, a very good writer. She clearly knows what she's doing, and has crafted some very nice prose in this book and others. But it's just not my thing. Sometimes an author's style just doesn't mesh with certain readers; I'm one of those readers. There were some funny moments in this book that provided some much-needed levity, and I definitely think Stifvater's upped her game with this book from the "Wolves of Mercy Falls" series -- not that her writing was bad there, either. THOUGHTS ON POLITICAL STUFF: OK, so I know this series has some queer representation, thanks to Tumblr, but I think it shows up later in the series, since it wasn't in this book. If there was any POC representation, I missed it -- I kind of skimmed parts of this, so it's very possible I did. I liked the abundance of female characters (as mentioned above, I much preferred the scenes focusing on Blue and her mom and her mom's colleagues to the scenes focusing on the boys), and I liked that Blue had agency beyond being Gansey's love interest. I did get a bit of an "I'm not like Other Girls" vibe off of Blue at times, though nowhere near as extreme as it is in other series. FINAL THOUGHTS: This is by no means a bad book -- if you enjoyed it, good for you. I know the fandom is massive, and I'm glad so many people like it! But it's just not the book for me. I hear there's a TV adaptation in the works, and I may check that out, but I don't think I'll be continuing on with the rest of the series. Thank you so much for reading this review! What are some popular books YOU don't get the hype for? Tell me about it down in the comments! Or, if you've read "The Raven Boys," tell me your thoughts below. If you liked this review and want to see more, why not subscribe? Just put in your email in the subscription box at the top of the page. If you really want to help me out and have some cash to spare, check out my Patreon page by clicking the "become a Patron" button, also at the top of the page, or clicking this link HERE. Patrons get exclusive access to things like free books and polls, and can even be promoted on this blog. Even $1 a month can help a ton! Thanks!